All place names from SDGW are listed within their historical counties at the time of the war and may not represent present-day county and metropolitan boundaries. § A soldier's temporary attachment to and/or from other units (inc. battalions of the Border Regiment). ¥ A soldier's permanent transfer to and/or from other units (inc. battalions of the Border Regiment). ‡ A soldier's previous military unit/s before serving in the Lonsdale Battalion (inc. other battalions of the Border Regiment). W. W. R. Binning was a soldier in the Lonsdale Battalion between 1914–1918. He attained the rank of Major and was 2nd in Command of the Battalion after Lt-Col. P. W. Machell. In early September 1914, Lord Lonsdale submitted a proposal to the War Office for a battalion made "entirely of men from the hills and dales of Cumberland and Westmorland." 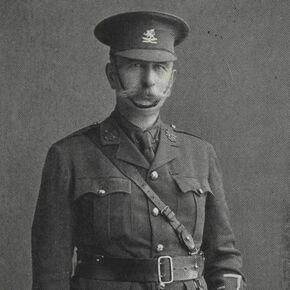 The approval of the Army Council was given on 17 September 1914 and, without delay, an Executive Committee was formed, of which Major Binning was appointed Governor of Local Committees representing the Carlisle district. After the formation of the Battalion it was decided to raise the "Lonsdale" Battalion in three detachments: Blackhall Racecourse (Carlisle), Workington and Kendal. The former was soon to become the Battalion's Headquarters. With just 75 recruits, Major Binning and Captain Sale "formed the nucleus of 'A' and 'B' the North Cumberland Companies." On 25 September the camp at Blackhall had started. The men of East and North Cumberland were enrolled by Binning and over a period of a few short months, Blackhall became the bustling epicentre of the Battalion and Major Binning was one of many important cogs ensuring the mechanism ran smoothly. ↑ Mr. F. R. Hodgson, and Captain Wakefield were also appointed Governors of Local Committees, at Workington and Kendal, respectively. Other members of the Committee were the Earl of Lonsdale, appointed Chairman, Colonel Weston, M.P., appointed Vice-Chairman and Mr. Gerald Spring-Rice appointed Hon. Secretary. ↑ 3.0 3.1 The Lonsdale Battalion Border Regiment, September 1914 to June 1915.